Gelatin is derived from the collagen that’s found in many animals, including humans. Collagen makes up about 35% of our bones (calcium phosphate about 65%) and almost a third of all the protein in the human body. Humans have consumed gelatin for years by way of nourishing bone broths. There are two brands of gelatin I recommend. Bernard Jensen’s 100% Pure Gelatin (pictured to right of smoothie above) and Great Lakes Kosher Gelatin. Jensen’s gelatin contains a whopping 12 grams of protein per serving (1 tablespoon). Both have virtually no flavor. You can easily add gelatin to pretty much any smoothie recipe. Combined with blueberries and a few other of my favorite ingredients and you have one healthy protein-packed smoothie. Enjoy! 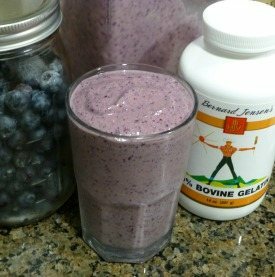 I’d love to know if you tried this blueberry gelatin protein smoothie – please do tell in the comments below. Happy Blending! I haven’t tried it, but I’m guessing it will set or fully congeal if you refrigerate. Might have to give it a try. I had a stressful day and just couldn’t finish this smoothie the other day…I put it in the fridge and it did not “set” enough to eat with a spoon. It was thick, but not “cheesecake” thick. You don’t need to dissolve the gelatin first? Nope, no need to dissolve the gelatin, Maegan. Can anyone tell me if gelatin is vegetarian, I once was told that there is a vegetarian version is this true ? There are some vegetarian gelatin options such as Agar and Irish Moss. I would Google “vegetarian gelatin” for more info. Gelatin is made from animal and/or fish bones and skin; that’s why it has collagen in it and benefits joints and bones when you consume it. Any vegetarian type of gelatin that you could find would be pointless to consume unless it was gelatin made from fish bones, as it is the bones here that are key (again, they are what give gelatin the benefits listed). Vegetarian gelatin is basically just chemicals and/or plant matter used as a thickening agent. Is there a difference between Knox gelatin and the brands you mentioned? The Knox gelatin isn’t from grass-fed animals. I can tell you the difference from personal experience: Knox gelatin tastes like crap. Seriously, i have no idea if it has anything to do with it being grassed or what but it tastes absolutely disgusting, which is probably why every recipe that uses it calls for a truck load of sugar. Maybe it has something to do with the fact that the gelatin comes from mixed sources (pig AND cow)? Who knows. It’s also not any cheaper than Bernard Jensen’s gelatin, which you can easily find in your local Vitamin Shoppe. Another reason not to buy Knox brand is that their gelatin often comes in individual envelopes with like 2.5 tsp of gelatin per envelope, making it a total pain to measure and even just figure out how much to use in recipes (most healthy recipes aren’t using Knox so it’ll be up to you to figure out how many envelopes to use every time). Other sources i’ve read say that gelatin does need to be dissolved for proper absorption. I posted one such link as my website for reference. My belief is that if you pour the gelatin into your blender full of liquid and blend it’s dissolved enough. Also has time to dissolve in your stomach before hitting your small intestines. I’ll have to revisit this belief and see if more thorough dissolving is needed. This smoothie has way too many calories for me (probably more than a whole meal!) but it inspired me to make a lower cal blueberry smoothie with some gelatin today and while it tasted fine I noticed that the gelatin wasn’t really dissolved all that well despite the fact that I ran it through the blender pretty thoroughly (or so I thought?). Also, it’s totally giving me a stomach ache right now but this isn’t the first time it’s done that. Most of my recipes are meant as meal replacements, thus the calorie count. I haven’t had an issue with gelatin dissolving, but others have reported that too. My guess is that less powerful blenders don’t do the job. You may want to dissolve in liquid before blending. Sorry to hear about the stomach ache. Maybe gelatin is one of those foods you should avoid. Thanks, Lisa! You are correct, nutritional info does not include add-ons. How much/many of these smoothies should you have a day?